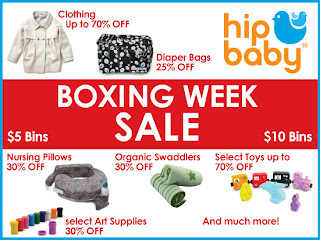 Hip Baby Blog: Boxing the year away! Christmas Day is just around the corner, and just around the next corner is, you guessed it, Boxing Day. But let's be honest, it's really become Boxing Week. Come to Hip Baby beginning on Monday December 26th until Saturday December 31st for our Boxing Week SALE and enjoy savings of up to 70% off on many of your favourite products on the Hip Baby shelves. And look for other savings like 25% all Diaper Bags! There will also be bins with $5 and $10 items and everything clearly marked for faster checkouts. More than likely, something that you love is on sale in our store.